Cool water, lazily moving fish, carefully placed shrubs and trees, and immaculately raked gravel. To the Japanese, all are combined using carefully observed rules, and all have allegorical meaning. 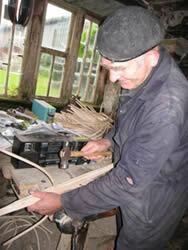 John in his workshop, built in 1632 – the workshop that is ! 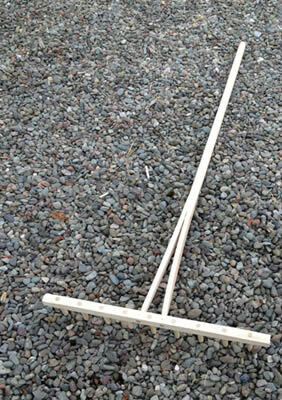 These handmade Japanese Garden Rakes are 5’ long, with a 2’ wide head. Both the handle and head are Ash, and the 9 teeth are of Birch. 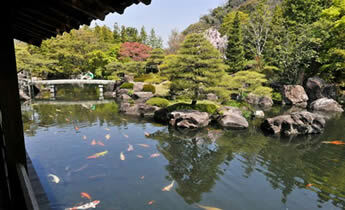 When was the first Japanese garden ? “In the spring of the year 74 AD, The Emperor Keiko put a few carp into a pond, and rejoiced to see them morning and evening". The following year, "The Emperor launched a double-hulled boat in the pond of Ijishi at Ihare, and went aboard with his imperial concubine, and they feasted sumptuously together". The tranquil, serene area of normally white or grey gravel signified purity, a place to welcome and contemplate your God, while bridges were said to symbolise the path to paradise. 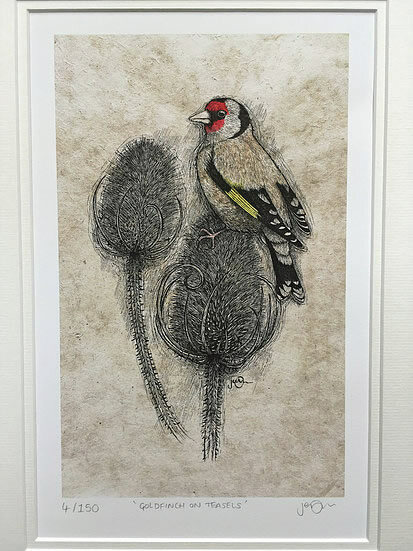 Over the centuries different influences subtly changed the gardens, for example Zen Buddhist monks escaping the Mongols in China, but the essential character remained. 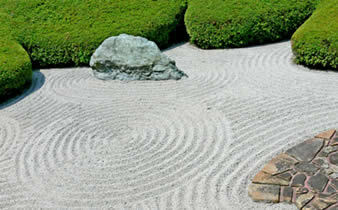 Japanese gardens are a place for peaceful contemplation, a place for meditation and reflection. And definitely a place you make sure your mobile phone is switched off ! What’s all this Japanese garden history got to do with us ! Well we have a bit of history of our own, so we thought what a great idea to combine the two. “She’s talking in riddles again”, I hear you muttering. 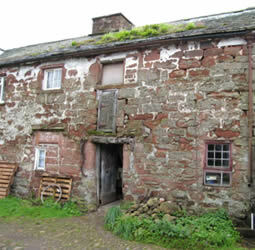 What I’m on about is that way, way back in the early 17th Century people started making things in a workshop in Cumbria – and a father and son, John and Graeme, are still making hayrakes in that same workshop today. Can you think of a better example of the blending of cultures than making a Japanese Garden Rake in the age old British way ? 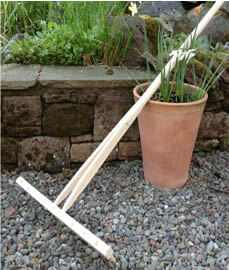 Hand made by craftsmen, this Japanese rake will ensure the gravel in your garden is always immaculate. Graeme took these photos in his Mum in Law’s garden. It was the nearest gravel he could find ! John and Graeme designed them, and each one is individually hand crafted, so your rake will be quite unique.